Chasing a burglary suspect through backyards of a suburban neighborhood has its challenges. You have fences to jump, swimming pools to go around and the most challenging, dogs to deal with. As the suspect jumped fences keeping a steady lead during the foot chase I have to admit that I was losing my breath. I was young and fit, but it was a long foot chase. How is it that I am a trained professional, in great shape, right out of the academy and I was unable to catch the burglar? Did he go to some sort of Burglar’s Academy? Was he taught to avoid capture just as I was trained to capture? Maybe his will to get away and avoid being put in jail outweighed all my training. Was it adrenaline perhaps? Probably not, I had plenty of that also. He may have been my equal in the “fit” department, but not so sure about the “smarts” department. I do not profess to be the smartest person around, but I know enough not to become a crook. I digress. Fence after fence I kept up. Finally after jumping the final fence in the neighborhood, I lost sight of the burglar. Where had he gone? I noticed a large doghouse in the corner of the yard. Had he been eaten by a large animal we call “man’s best friend?” Was I next? Either way, I was not going to take a chance. I slowed down to a crawl as to not disturb the sleeping beast within. I was still in a hurry; after all I did not want to waste a good foot chase for nothing. 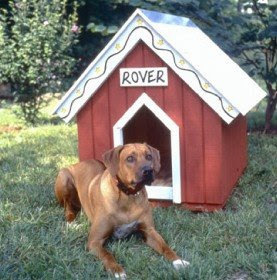 Just as I was about to jump the fence without disturbing the dog, I heard a loud growl come from the doghouse. This could be bad. I was about to continue my pursuit, and most importantly get away from the mean pup, but something did not sound right. The dog was either very sick or was some sort of pet that was “not dog.” I had to look. I peered inside and noticed a blanket was definitely covering something big. As promised, here is the story ABC News aired tonight. 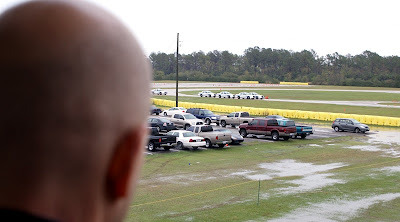 Thank you ABC News, Charles Gibson, and staff, for such a compelling story. Mark Durham moved his wife and children from Detroit last fall for the promise of a more stable career with the Houston Police Department. 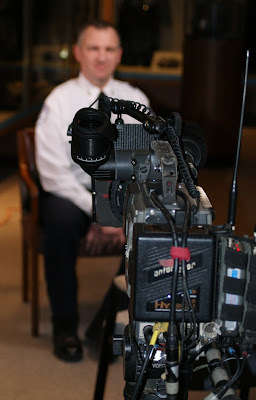 Mark, a police cadet in Academy Class 202, and his wife Patti, were recently invited to be guests on ABC's World News with Charles Gibson. Mark's portion was filmed on Friday and Patti's portion was filmed this morning. The story will be shown TONIGHT at 5:30pm on ABC. 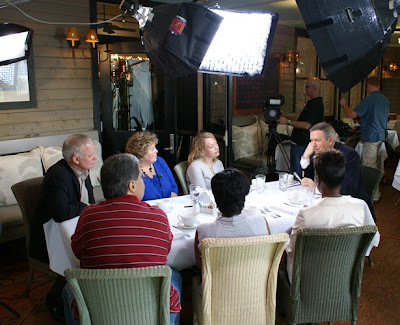 The story focuses on a group of individuals, including Mark and Patti, who moved to Houston to find a career due to the economic downturn in other parts of the country. I was on hand to watch Mark and Patti complete their interviews. They both did a wonderful job. Be sure to tune in tonight for the show. If you miss the broadcast don't worry, I will post it on the blog as a soon as I can. 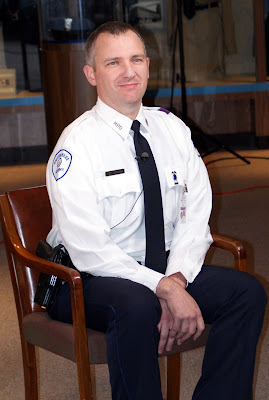 In 1998 Officer Higgins was shot by a suspect which left her in a wheelchair for the rest of her life. 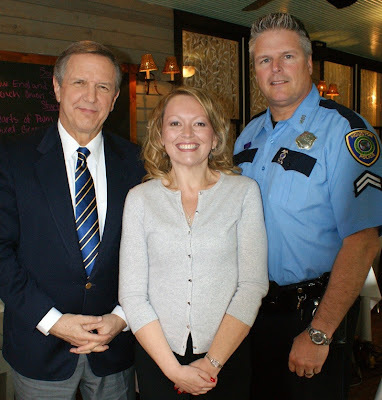 Channel 11 KHOU recently caught up with her to see how she was coping. The most amazing thing she said during the interview was about her HPD family and how she would do it all over again if she could. You need to see this. 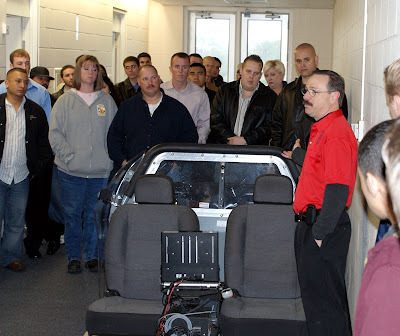 I wanted to take this opportunity to thank everyone who attended the Academy tour this morning. I hope everyone enjoyed it as much as we did. 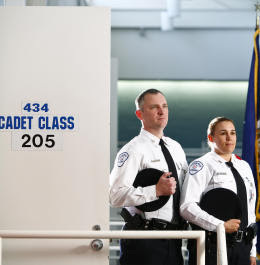 We look forward to seeing all of you in the future as a cadet rather than a tourist. A special thank you to Captain Lentschke, Lt. Torres, Senior Officer Chapman, Officer Herb and the Academy staff. 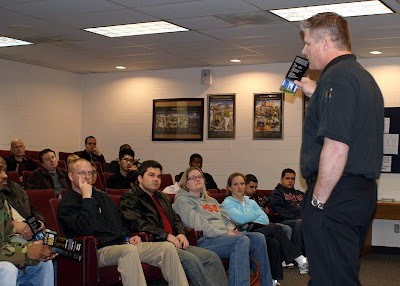 Academy Tour today at 1000 am for those who signed up via email with me. If you missed the sign up we will have one next month. Look for future tour information on the blog. The address is 17000 Aldine Westfield at Rankin Road. (Close to Bush International Airport) Dress warmly and comfortable. Everyone meet around the fountain in the center of the complex. Eat a good breakfast as the tour will last to about Noon, with a Q & A afterwards. For everyone who signed up for the Academy Tour, it is still going to be held from 1000 am until Noon tomorrow (Friday). Wear comfortable shoes and warm clothes as we will be outside on occasion (weather permitting). We will all meet by the center fountains. It will be fun and interesting. If you missed the deadline for signing up, don't worry we will be doing it again next month. Senior Officer James Chapman does a fantastic job running the museum and came across a very old audio recording talking about of all things, recruiting! He was able to save the audio after hours of adjustments and audio cleaning. This clip is about 12 minutes long, but you need to watch it. Frankly, many things have not changed as far as the recruiting process goes. It's worth a look and fun to see how the city has grown. Hard to determine the exact date, but it was probably from the 1950's. Donuts and Cops: Fact or Myth? These two pictures were taken on the morning of graduation day for Class 201 last week. I promise these pictures were not staged. The donuts were purchased by the sister of one of the graduating cadets to celebrate their impending graduation later that night. 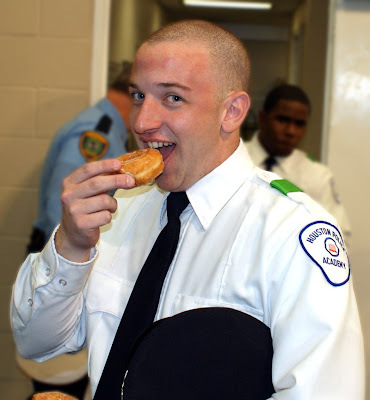 You always hear jokes about cops at donut shops and it is a typical stereotype about police officers. 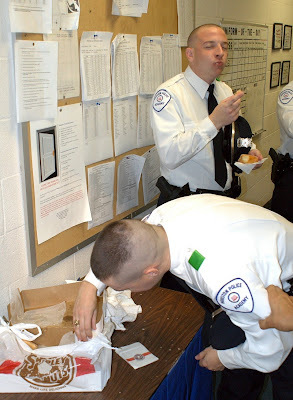 I think the myth surrounding cops and donuts comes from the fact that police officers sometimes work unique shifts when most restaurants are closed. Years ago, donut shops were the only place to find something to eat at night. When an officer wanted to stop for a break, coffee and donuts were convenient and quick. A police officer is always on call and if someone needed us, we could leave the donut shop at a moments notice. When the donut shop was the only place to eat and the only place that was open, sometimes you would see more than one police car in front of the shop, thus creating the illusion or myth that cops and donuts go together like “peas and carrots” (as Forrest Gump would say). The all night donut shops are almost all gone now. Donuts shops have been replaced by Starbucks or 24 hour fast food restaurants. However, I still think the whole “cops and donuts” myth will continue to live forever. The only donut shop I go into now is the one that sells “donut holes” for my five year old. I wonder, am I unconsciously teaching her to become a police officer, or is just that donut holes taste good? This clip came from a film called "Beautiful Country." It's interesting to me on several levels. Let me describe the clip. 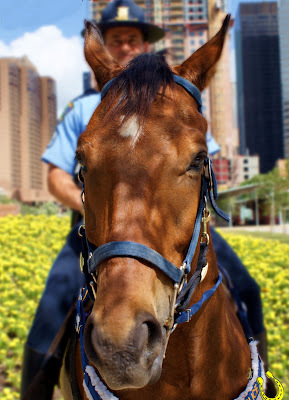 A Houston Police Officer responds to a call regarding a person trespassing on someones property. The officer asks the man to move on and he complies. Now here's the interesting part. The car that the Houston Police Officer is driving looks nothing like a Houston Police Car. It's a big white car that simply states "police" on it. The scene was filmed in Dallas, Texas (why not use a Dallas Police Officer?) and not Houston. The third interesting part, is the "Houston Police Officer" is played by my brother Don, who lives in Dallas and he is not a police officer in real life, but as he says "just plays one on TV." The director of this film was asking around about cops and hats and would a police officer wear his hat in the car. My brother overheard the director and told him he could ask a real police officer from Houston (me)that exact question. What was the answer? Watch the clip. Who wears a hat in the car? I mean really. 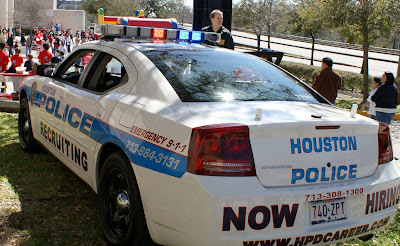 If the director was so concerned about whether or not a police officer in Houston would wear his hat in a police car, why not make a police car look like a Houston Police car? What's really funny about the clip, the director made sure the hat was in the scene by having it placed on the dash. The "zoom in" was not in the actual film. I just wanted you to see our patch! He did get the patch and shirt right. Actually the film was quite good. Class 201, What Did You Do? Many careers change throughout ones lifetime. 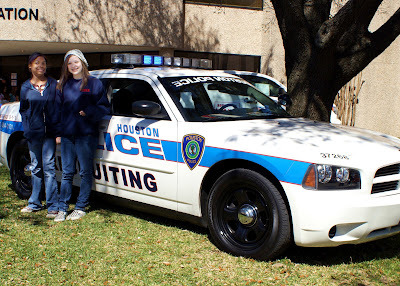 Once you become part of a team, family and institution such as HPD, you won't want to leave. Being a police officer is unlike any career you have had before. The camaraderie is hard to explain unless you experience it for yourself. Class 2o1 will be close forever, and many, if not all, will go on to a long and storied career with HPD. Why not change your career and join our family today. Have I mentioned that we are hiring? 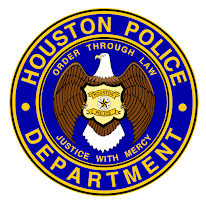 Academy Class 201 graduates tonight at the Houston Police Academy located at 17000 Aldine Westfield. This morning after six months of intense training to become one of the best, the class gave one final roll call. As everyone else got ready for work the proud sounds of Class 201 resonated throughout the academy. I don't care how many times I film this, I still get goose bumps. Way to go 201, make us proud! St. Thomas High School Annual "Round Up"
Great crowds and great food. It was fun for all! This little guy kept shooting us with his brand new "Marshmallow gun". I have to admit he was a good shot. I gave him my card and told him to call me in 8 or 9 years. These two wanted to take the car for a "spin". Over 100,000 hits and counting! 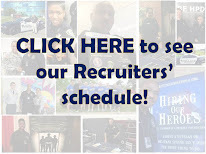 Thank you for your support and interest in the Houston Police Department Recruiting Unit. March 2009, marks the one year anniversary of this blog. While I have your attention, why haven't you applied yet?